Choctaw Travel Plazas were created to provide the essentials for all of your travel needs. 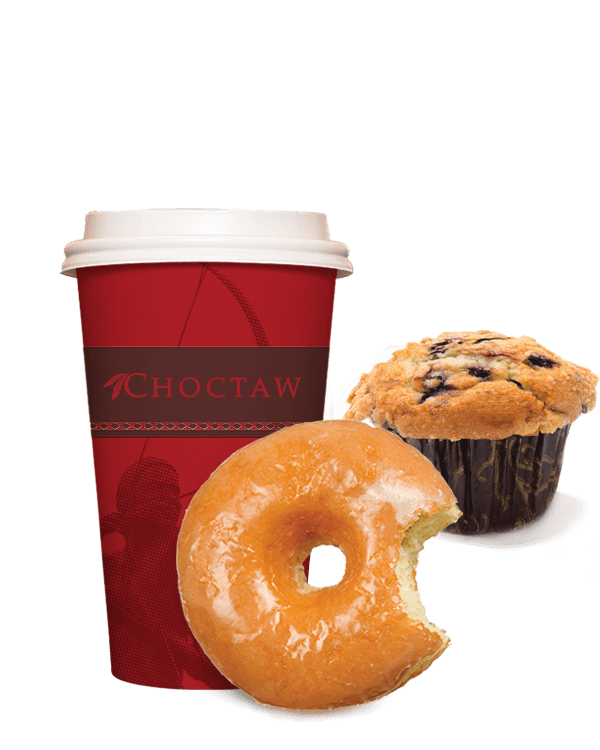 Clean restrooms, cold or hot drinks, snacks, refreshments, fuel, authentic Choctaw merchandise, and even a little gaming action at the Casino Too! We also offer an extensive variety of tobacco items – everything from cigars to leafy products, and much more at the Smoke Shop. Don't forget, we have free WiFi, too. At Choctaw Travel Plaza, we realize many customers are concerned about their caloric intake and prefer to seek out healthier options for snacking. That's why we've created a section dedicated solely to healthier choices. Find lots of options that will "hit the spot" with both your palate and your waistline! No matter the conditions, we likely have the perfect beverage to suit your needs. On a blazing hot day, come in and pick up an ice cold fountain drink to cool off. And when the temperatures go south of 32°, swing by and find a huge selection of toasty warm beverages to keep you going. There's nothing better than starting your day with a fresh cup of java or cappuccino, then cooling down later with a fresh iced tea or cold fountain drink. The Chahta Grill has a wide variety of fresh made-to-order menu items. From breakfast fare to lunch options to the dinner table – we've got your appetite covered. Start the day by building your own omelets or enjoying a fresh stack of pancakes hot off the griddle. Swing by for a daily lunch special with "all the fixins," like an open-faced pulled pork sandwich – complete with two sides, and a yeast roll. Need something quick? Hit the Hot Box for hot dogs, sandwiches, breakfast burritos and much more. Call-ahead ordering and bulk-order options for parties and events are also available. Whether you need chips for a party, munchies for the "big game," or just some candy for your sweet tooth, we've got what you need. 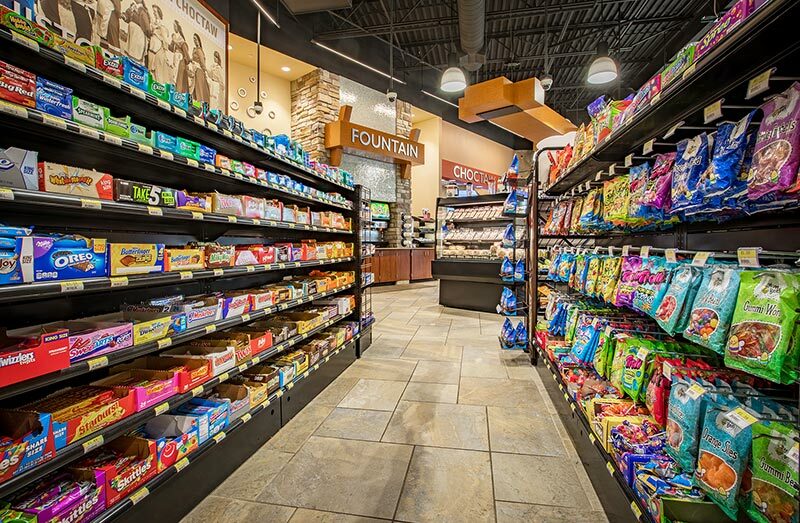 Take your time perusing our snack aisle, or just come in to grab something tasty and hit the road! On the go? No problem. Swing in and grab some soft donuts or sweet pastries. Looking for dessert? Pick up a box of cookies! From cinnamon rolls to danishes and everything in between, our bakery case has you covered. With today's advanced engines and technology, it can be a challenge to have peace of mind that you're selecting the very best fuel for your vehicle. That's why all Choctaw motor fuel is guaranteed not to harm your engine. If ever you experience an engine problem as a result of our gasoline, we'll take care of it. We can only offer a guarantee like this because our standards require only the very best quality fuels be sold at our pumps. Offering Regular Unleaded, Mid-Grade Unleaded, Super Unleaded and Diesel. You can find an impressive selection of Choctaw Farms products at all Choctaw Country Market and Choctaw Travel Plaza locations. Good for the heart, good for the stomach, good for the spirit. Our stores carry a wide range of Authentic Choctaw merchandise and artifacts available for purchase. Many of these items are handcrafted in the same native fashion as the original artifacts were created. Discover our home goods, jewelry, apparel and much more. What's the biggest difference between Choctaw Travel Plaza and other fuel locations? You could walk out of a Choctaw Travel Plaza richer than you walked in! Our Casino Toos offer some of the most popular slot machines available!